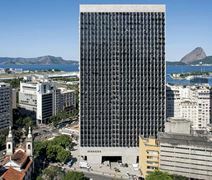 This exquisitely furnished and luxuriously maintained corporate venue and prestigious business location is part of an impressive landmark skyscraper that is key and central provider of premium standard, state of the art office space in the vibrant and commercially significant main business zone of Rio de Janeiro. The regional transport links are also excellent and connect the center to the wider reaches of the area with ease. This contemporary and fantastically furnished landmark business centre is situated in a prestigious and locally renowned area of Rio de Janeiro's main commercial hub and central business district, close to many tourist attractions as well as restaurants and other amenities. The centre provides high-quality office accommodation that is flexible and well equipped. This centre offers you a sophisticated image for your business. This business center is situated in the financial center of Rio de Janeiro, close to major corporations and excellent transport links. The center offers modern, spacious workspaces that are flexible and ready for you to move into. The area's primary regional transport links are also excellent, with a large number of convenient and frequent services in operation throughout the area and its surrounding districts. This exquisitely furnished and state of the art business center establishment is a key corporate location, fully equipped with a number of technologically innovative facilities and corporate benefits available to all occupying tenants. The site offers spacious meeting rooms, high speed internet connections, dedicated corporate telephony, on-site management, breakout space, flexible terms of occupancy and much more. This contemporary and stunningly situated corporate business installation is a key provider of modern, and sophisticated workspace solution packages ideal for any manner of professional tenants and business requirements. Offering a multitude of office facilities and technologically innovative provisions, this building is the ideal working environment for both collaborate co-working needs, as well as individual professional tenants. This fantastic and state of the art corporate business installation is a key commercial establishment and promotes innovation and industrial development from within this vibrant and significant corporate community. The site offers all prospective clients with such extensive services and professional provisions as spacious meeting rooms, high speed internet connections, dedicated corporate telephony and more. This extensive and exquisitely furnished business center installation is a premium standard corporate venue and offers professionals of any industry or corporate background with a range of workspace solution packages and corporate facilities including high speed internet connectivity, conferencing capability, spacious meeting rooms, on-site management, secure parking provision and much more, in addition to excellent local transport links. This prestigious and exquisitely furnished business center installation provides all prospective and potential corporate occupants with an extensive variety of specialist and fully functional workspace solution packages as standard including such space types including serviced office suites, collaborative coworking spaces, spacious meeting rooms, conference facilities and much more. The site is also easily accessible from the wider region at large. 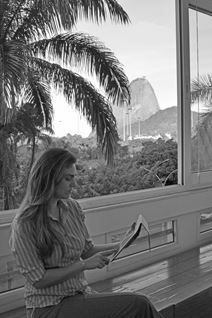 This exquisitely furnished and executive contemporary business center is situated within one of the most popular, desirable and highly sought-after corporate locations in all of the thriving and world famous city of Rio de Janeiro. Offering a wide range of high end corporate services including spacious meeting rooms, flexible terms, conferencing facilities, 24 hour access and specialist support and management services; this center is the ideal location for professionals in search of a comfortable and productive working environment. Set in a stylish and well furnished contemporary office building, this serviced business centre offers a wide and extensive range of suite types and professional spaces on desirable and highly flexible occupancy terms. The district boasts large open areas and a pleasant feel. A variety of other prominent business have made this area their home, and the address is close to retail and other amenities. This impressive business centre is located in a newly-constructed building in Rio de Janeiro. The building boasts features such as a private gym, secure underground parking for tenants, several meeting rooms and a lounge area. The centre is situated in a pleasant part of the business and tourism district of Rio. Prominent international corporate tenants in the area include Coca Cola and Lucent Technologies. 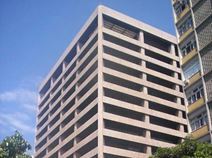 A fantastic business centre in the beachside Botafogo area of Rio de Janeiro. 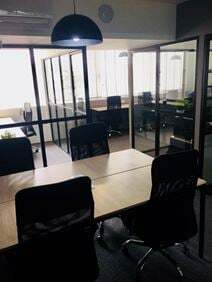 This centre features a range of different office spaces, as well as a reception area, conference rooms and a cyber café, and boasts first class infrastructure. The centre also features beautiful views of Sugar Loaf and Guanabara Bay. The area has a range of services, including shopping malls, banks and executive services. This fantastic business center and corporate location in one of Brazil's most important and culturally significant commercial districts offers stunning views of the beach and marina, as well as a host of other premium business support services and amenities. Set within an excellent and easily accessible professional location, with straightforward access to the rest of the city and with secure parking facilities close by. Situated in front of Flamengo Beach and with spectacular views of Sugar Loaf Mountain, this exquisitely furnished and spectacular corporate installation is home to the area's main business and corporate event venue and represents a wonderful opportunity to take up incredibly provided serviced rooms and open and collaborative co-working office spaces in a secure and comfortable neighborhood close to the main downtown area. This state of the art and technologically innovative flexible workspace installation is ideally located in an engaging and commercially significant area of Rio that consists of restaurants, cafeterias, hotels and important institutions such as the United States Consulate General, Sesi Theater, Notary (24 ° Oficio Notes), French Consulate and several international chambers. Just 500m from Santos Dumont Airport. This technologically sophisticated and premium standard office center and business installation is one the region's key and foremost workspace solution providers, offering fantastic quality and modern, fully functional working environements to professional tenants of any industry or corporate background and are ideal for any type or size of professional business requirement. The area also features numerous facilities and amenities including shops, restaurants and transport services. 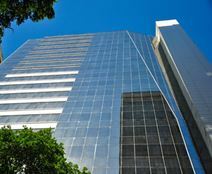 A range of offices are available to lease in this quality Rio de Janeiro business centre. Features of the centre include a fully-equipped auditorium, internet café, conference rooms and an elegant reception area. There is a spectacular view of Guanabara Bay from this excellently designed building, which is surrounded by all manner of entertainment amenities. The building is conveniently located, with good access to both northern and southern areas of the city and it is within 5 minute's drive of Santos Dumont Airport. This extensive and highly prestigious business installation is a key and commercially significant corporate venue, offering all prospective tenants the opportunity to base their professional operations from within this state of the art and landmark office building. The site offers such high class facilities and services as spacious meeting rooms, conferencing capabilities, breakout space and much more as standard. 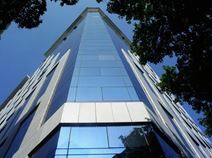 This exceptionally provided executive business centre is located in a modern landmark office building in one of the fastest-developing areas of Rio de Janeiro. The business centre features CCTV security, access control and digital telephone lines. There is a shopping mall within walking distance of the centre, one of the biggest in the city. The centre is also near several parks and a train station. With a large choice of fully functional and serviced private office suites or open spaces that can fit up to 39 workstations with ease for more open and collaborative group based working, this premium business center is located exceptionally close to the vibrant center of Flamengo and every kind of business amenity you will need. For added convenience it is also close to the Santos Dumont domestic airport. Offering an exceptional range of cutting-edge and state of the art serviced office solutions for all types of clients and requirements, this centre is housed on the 16th floor of one of the newest buildings in the district. Close to the airport, within easy walking distance of the train station, and close to a great selection of local amenities including shops, restaurants, cafes, bars and some exceptional hotels. Set in a prominent and elegant period building that has been recently renovated to encompass a significantly diverse range of the very latest in state of the art technological facilities and business equipment, these newly arranged refurbished and serviced office suites combine luxury with modern convenience. This centre is conveniently close to a range of retail, as well as good transport connections. This coworking space has a secure valet parking and full concierge service available on request. After work you can enjoy a theatre play straight in the iconic Teatro Riachuelo. You can book one of the meeting rooms designed to keep your team or your clients comfortable, creative and focused, and the staff will ensure you have everything you need. From audiovisual equipment and whiteboards to food and beverage service. You need to get out of your everyday environment in order to get your creative juices flowing. An impressive centre which features a range of office-spaces that are available on flexible terms at affordable prices. Tenants can make use of the super fast internet connection, 24-hour access, spacious meeting rooms or quiet meditation room. The local area is filled with shops, restaurants, bars and trendy cafes, providing an opportunity for everyone to enjoy something outside of working hours. Public transport links are numerous, allowing for quick and easy travel around the city. Set in the heart of the world famous and hugely renowned city of Rio de Janeiro, with easy access to a range of excellent and highly convenient transport options, this comfortable and high-quality premium serviced office establishment in Rio de Janiero's main central financial district and commercial heart provides a range of office suites and workspace solutions to suit any business needs or requirements, as well as a variety of other spaces suitable for meetings, training and presentations. This modern, Grade A building is strategically located close to the centre of Rio and as well as private office spaces with and without windows, and collaborative co-working space, tenants also have access to lovely breakout spaces, meeting rooms and conferencing facilities. The regional transport links in the area are also excellent, with a range of convenient and frequent services in operation throughout the locality. 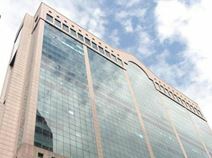 This fantastically well equipped and premium standard professional business establishment and corporate venue offers prospective tenants with some of the region's foremost and most exclusive business workspace solution packages, and is a central and majorly significant commercial presence the vibrant corporate district of Rio de Janeiro. The local transport services are also excellent and make the center easily accessible. This extensively supplied and technologically sophisticated business center installation is a premium standard and technologically sophisticated corporate working environment, fully functional and supplying all prospective tenants and professional occupants with a number of services and facilities including conference suites, spacious meeting rooms, high speed internet and more. The site is easily accessible, making it the ideal function venue.